I am a student of the Development Academy of the Philippines. tourism to the overall economy of the province. 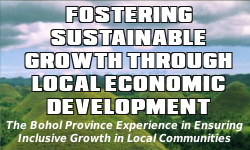 Tourism and agriculture are the 2 major economic drivers of the province of Bohol. However, agriculture plays a much bigger role in the economy of the province than tourism, Bohol being an agricultural province. Bohol’s agriculture sector remains to be the major source of employment and livelihood, with 42% of the province’s population working or dependent on agriculture (NSO). I am conducting a research on the Engagement of LGUs in Sustainable Tourism in Bohol. I would like to inquire if your latest Tourism Master Plan is the one you released last 2008.. When will you publish a new Tourism Master Plan? If there’s any relevant data about the tourism industry and the role of LGUs in Bohol that you can share, I would really appreciate it. Hi Hanna, there is no plan of updating the Bohol Tourism Master Plan as yet. It is however a long-term plan and is still applicable up to now. However, another plan is on the process of updating, in which the Tourism Sector is a part of. Currently, the updating process is still on the data generation and discussion for the situationer. In case it might help you, please click HERE to download a zipped presentation file on the current tourism situation of the Province of Bohol.